Andy Peaks insists it’s “all about results” now as AFC Rushden & Diamonds look to take another step towards securing a play-off place tonight (Tuesday). 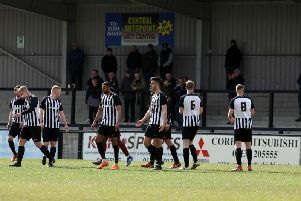 A 1-0 success over Hanwell Town at the weekend saw Peaks’ team move three points clear of Chalfont St Peter in the race for a top-five finish in the Evo-Stik Southern League Division One Central. And with just two games of the regular season remaining after tonight, the manager knows another victory will go a long way towards securing a play-off place in Diamonds’ first campaign at this level. “It’s a massive game for us,” Peaks said. “Things are really taking shape with three games to go and we are just focused on trying to pick up another three points. “We are hoping for a big crowd with the ‘pay what you want’ initiative and we have to be positive because we have picked up in the last few games. “We probably haven’t played that well in the two matches we have won but when it gets to this stage of the season, it’s all about results. To an extent, it’s not about the performances. “It will be a tough test for us, I think they were a bit unfortunate against Kings Langley (in a 2-0 defeat) at the weekend from the report I have had. Diamonds will definitely be without striker Elliot Sandy after he suffered a broken nose during Saturday’s success. But Peaks insists he does have “options” including frontman Jack Bowen, who had previously signed a dual registration from United Counties League Premier Division side Cogenhoe United. “Elliot will be a big miss for us,” the Diamonds manager added. “There’s no chance of him being involved in this game but I think we will see him again this season.